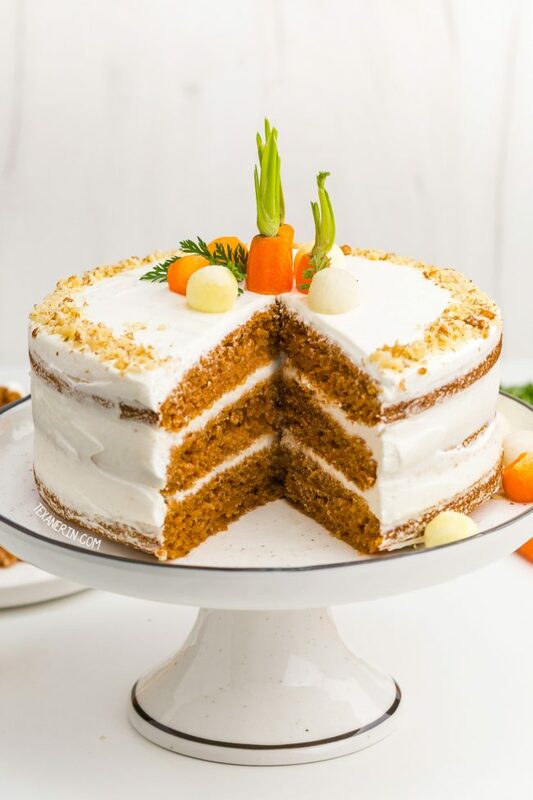 This 100% Whole Wheat Carrot Cake is incredibly moist and nobody will believe it’s whole grain or made slightly healthier! Recipe includes a less sugary cream cheese frosting. Can also be made with all-purpose flour. 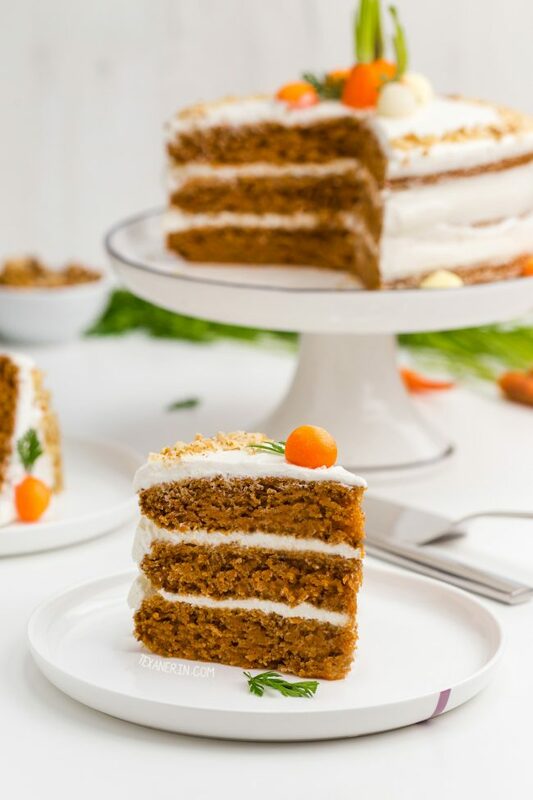 I’ve seen a lot of carrot cake recipes around lately and most of them claim to be the best carrot cake recipe ever. And here’s another one! Seriously. The best carrot cake I’ve ever had. If you prefer carrot cakes without chunks of carrots, pineapple, nuts and other stuff, this is your recipe! I really do not like carrots. I couldn’t possibly have carrots in my cake unless they were undetectable, so I used the really fine grater of my food processor. I’ve also used a Microplane zester but that took a long time. I’ve brought this cake into work several times and all the Americans recognized it as carrot cake. But nobody has ever had any idea that it was a whole wheat carrot cake! If you don’t want to use whole wheat, you can also use all-purpose flour. Both versions taste the same. And for a gluten-free version, I used this gluten-free baking flour. And it tastes just like the other two versions! A lot of cream cheese frosting recipes use a ton of sugar. Not this one. I reduced the sugar by quite a bit and now it tastes more like a cream cheese tart filling than super sugary frosting. It’s a 1.5x version of my healthier cream cheese frosting. If you just want to frost the top of each layer and nothing on the side, check out the notes below for how much to use. By the way, if you’re wondering what else to make for Easter, this scalloped potatoes and ham recipe from A Mind “Full” Mom look incredible! 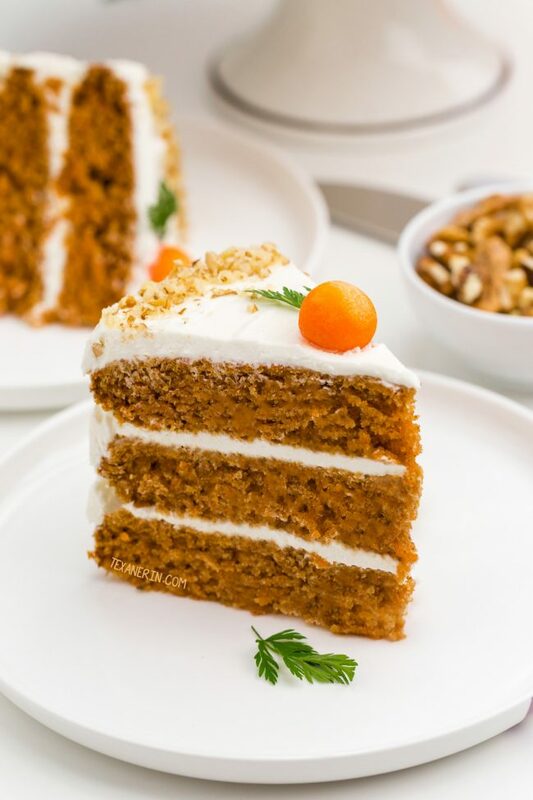 And if you prefer a sheet cake, try this maple carrot sheet cake from Healthy Seasonal Recipes! Note: This recipe was updated on 3/14/2018 with new pictures (one of the old photos is below) and a new frosting recipe! The old one can still be found in the recipe notes at the bottom. Preheat your oven to 350°F / 175°C and grease three 8″ pans or line them with parchment paper. In a medium bowl, combine the flour, baking soda, salt, cinnamon, nutmeg and ginger. In a large bowl, whisk the eggs and then add the sugar, apple sauce, and olive oil and mix until combined. Add the dry ingredients to the wet and stir just until combined. Then fold in the carrots, again only until combined. Bake for 13 – 17 minutes or until a toothpick inserted in the middle comes out clean. I accidentally had the fan on so these minutes could be off. It might be longer, but just check it at 13 and see how it is. Let cool for 5 minutes in the pans, and then turn onto a wire rack to cool. For the frosting, beat together the cream cheese and Greek yogurt. When combined, add the powdered sugar, a little bit at a time. This frosting isn't pipeable, but if you refrigerate it overnight, it it sets a little more than when first made. This recipe only makes enough to fill the two layers and the top. You can see that the layers also only had thin layers of icing. I used a little less than 1/2 cup per layer. If iced, store in the fridge. The cake stays moist for several days. I used the fine grater of my food processor. I can’t say if this would work if you grate them coarsely. It might lose some of its moisture. Mine was almost like a puree. We have a different type of cream cheese in the US that's firmer and meant for baking, rather than for toast, like in Europe. For 8 ounces (225 grams) of cream cheese, buy a 300-gram package (the stuff at Aldi, Lidl, etc. works just as well as Philadelphia), put it in the center of a clean tea towel or cheesecloth, and squeeze out the liquid until you have 225 grams of cream cheese. You can now make cream cheese frosting without issue. So for this recipe, buy 675 grams of cream cheese and squeeze out the liquid until you have 510 grams. This recipe was updated on 3/14/18 with a new frosting recipe. The previous was called for 8 ounces (225 grams) cream cheese, 1 6-ounce container (170 grams) Greek yogurt, and 1/2 – 1 cup (60 – 12 grams) powdered sugar. 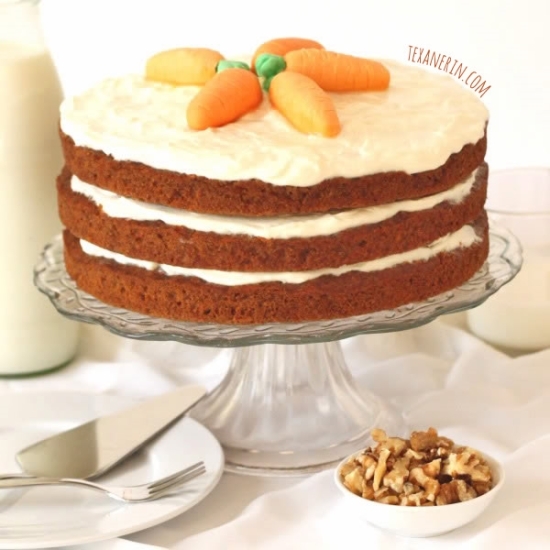 119 comments on “100% Whole Wheat Carrot Cake” — Add one! 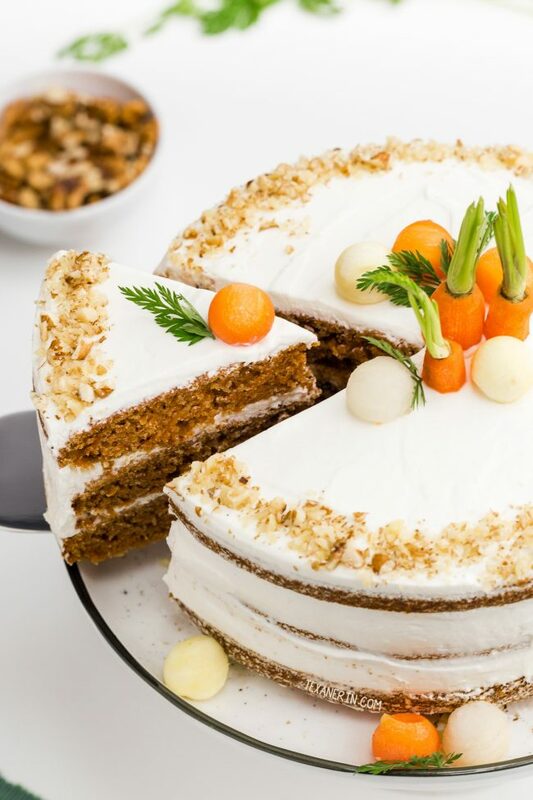 Thank you so much for sharing this low sugar carrot cake recipe. HEre 1 Teaspoon means flat or heaped teaspoon? ALso one more doubt, the weight of the carrot is before peeling or after peeling? I’m so sorry for just now seeing your questions! Measurements are always flat unless the recipe specifically says heaped. :) The weight of the carrots is peeled. Hope you’ll enjoy the cake! Thank you for your reply. Before getting your reply, I tried as a sheet cake by doubling the recipe by replacing the apple sauce with equal cups of greek yoghurt (since i didnt want to add much oil) , but it was so yoghurty, still it tasted awesome after 2 days. Is there anything else i can add to replace the applesauce? As you can probably tell, I’m having issues with the comments. :( Sorry again for just now seeing this. There’s not really a good sub for applesauce. You could do oil or a mix of sugar and oil but I don’t think that’ll help you. Sorry I can’t be more helpful. do I need to put applesauce In an earlier comment, you said substitute with oil but along with the olive oil, would it be too oily? You can use either applesauce or oil. It wouldn’t be too oily with more oil. That’s how I used to make it! Hello, I am wondering if this would do well in sheet pan? Also would I most likely double the recipe for a sheet pan? Thanks so much! Hello! I haven’t tried it but here’s a pan conversion chart that you might find useful. :) Hope you’ll enjoy the cake! This cake is absolutely delicious! I have made it multiple times over the past couple of years. I’ve made it as a sheet cake, as a layer cake, and most recently, as cupcakes. Per a comment I saw, I added 1 tsp. of baking powder to the recipe when making this recipe as cupcakes and it was perfect! Thank you, Erin for sharing this lightened yet decadent treat! Hi, this recipe looks delicious! Is there a way we could get nutrition facts on it? Thank you!! Haha. Happy your German enjoyed it. ;) Thanks again for your feedback! Do you know if I can use almond flour instead? I cant eat gluten so was wondering. Thanks! Would I be able to sub butter in place of oil? Also I’m planning on making cupcakes, do you think this recipe will yield around 24? Hi! I haven’t tried it but I think it’d work. But the cake would be less moist so I definitely recommend some kind of oil. :) And it will yield 24 cupcakes. Hope you’ll enjoy them! Thank you! I’ll stick with oil. Also, do you think I could sweeten the cream cheese- Greek yogurt frosting with maple syrup (as your other recipe does) instead of sugar, or would it be too runny? I could of course skip the yogurt, but it sounds like such a yummy addition! I think it’d be too runny. Which recipe of mine uses maple syrup? I have so many I many I’ve started to forget. :D This one just uses maple, but it’s based on mascarpone and heavy cream. And it’d be amazing on this carrot cake! Oh my word!! LOVE carrot cake and this heathier version. I will be making this with my scalloped potatoes for sure! I found your website today while looking for a spelt carrot cake recipe. Made this and loved it! I halved the recipe and baked it in my cast iron skillet. I didn’t have regular Greek yogurt, so I subbed coconut Greek yogurt. It was amazing! I can’t wait to try some of your other recipes. Hey would love to try these, any substitute for applesauce? Hi there! Oil should work. That’s what the original recipe used and I subbed applesauce for it. :) And sorry for my slow reply! Thanks! Will make it today! Made these today, 5 stars for taste. I really don’t like too sweet desserts and this was great. Really like that the ingredients are simple and had half the sugar of other recipes I read. Made them as cupcakes, 22 total. Would have preferred they rise more but I’ve never had cupcakes rise well. Would try it again as a round cake and might add nuts. Thanks for including the grams, made measuring much easier. Also like the icing, used 3/4 cup sugar and can actually taste the cream cheese instead of store bought sugary stuff. This recipe was a bit of a disaster! I checked and rechecked the amounts but my batter was waaaay too wet. No way these would be done baking in the timeframe given as a cake (I did cupcakes and still had to bake longer). I added more flour to second batch to help remedy them. It also seems like way too much oil, as the cupcake papers ended up saturated in oil. Good flavor though. I’m sorry it didn’t work out! If you click on “older comments” at the bottom of the page, you’ll find several reviews and they’ve all been positive. I’m afraid something must have gone wrong. They definitely shouldn’t be oily! Did you make any changes or subs at all to the recipe? Made these as cupcakes this morning and they turned out incredible! The flavor is fantastic and the texture is awesome! They are moist yet light. The flavor reminds me a lot of Morning Glory muffins, which are my favorites but I have never found a good recipe for them. The only things I did differently was adding some vanilla because I love vanilla and adding one tsp baking powder for extra fluffiness. I am so glad to have found this recipe. My son loves it as much as my banana muffins and thus far those have been undefeated favorites. Thanks for a wholesome alternative to the traditional cake. Serving these with cream cheese frosting on Easter and I don’t think anyone will miss the sugar. Excellent job! Hey! This looks amazing and I am thinking of making it for Easter. I always want to use whole wheat flour in cake but have found that it requires a recipe intended to be that way for it to turn out well. So I am really excited to try this. I was wondering if you have any idea how many cupcakes this might make? I look forward to making it and letting you know how it turns out. It’ll make 24 cupcakes (each mold filled 3/4 full). Bake for 12-18 minutes. :) I hope you’ll enjoy them!